St Mary’s Church was built in 1850 replacing the original thatched chapel, which stood on the same site in Irishtown since 1660. Plans for the present building were prepared and agreed in November 1836. The church, dedicated to Our Lady under the title of the Assumption, was completed and blessed by Most Rev. Dr. O’Brien, Bishop of Waterford, on the 12th October 1856. The stone used for the main construction came from quarries in Kilmacomma and Mullinahone. The stucco ceiling was made possible by a legacy in 1854 from the estate of Mr. Nicholas Cott, a resident of Irishtown. The High Altar was the gift from Mr. William Hudson. It was designed by the English Architect George Goldie, and was completed in 1867 at a cost of 2,000 pounds. It consists of Portland stone, columns of Aberdeen granite, and with inserts of Cork and Connemara marble. The belfry tower was added in 1885 and the portico was completed in 1890. 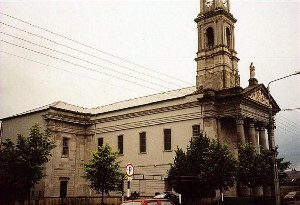 In 1836 the parish was divided into two, the new parish taking the title of SS. Peter and Paul’s and getting possession, at the same time, of an auxiliary church which had been erected in 1810. In 1983, on the First Sunday of Advent, the parish was again divided with the creation of St. Oliver Plunkett Parish. The tomb of the first Mayor of Clonmel, John Fitz-Geffry White, who died in 1615, was brought to St. Mary’s Irishtown from Old St. Mary’s Church. In November 1936 St Mary’s was consecrated by the Most Rev. Dr. J. Kinnane, Bishop of Waterford and Lismore.